With our move to the new place, there were plenty of opportunities to re-work and re-arrange the way each room looks and feels. To add to that, the apartment we bought came fully furnished- so we had 2 of everything! One of the rooms we finished first was the dining room, as we love to entertain and couldn’t wait to host our friends and families. 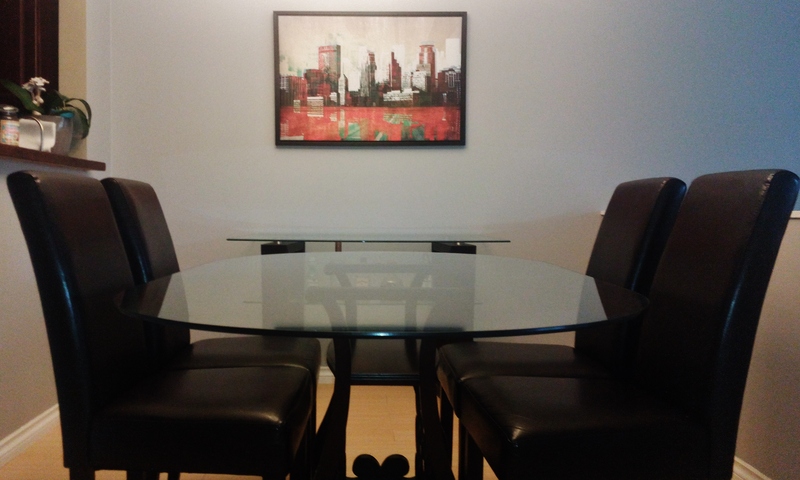 After some discussion, we decided to give away our old wooden dining table (last seen here), in favor of this oval glass table and set of 4 upholstered chairs that came with the apartment. I was originally not a fan, as I don’t like dark wood color, and thought the “wine rack” base looked a little funny. Add to that the fact that I’m terribly clumsy, which is not a good mix with glass anything! 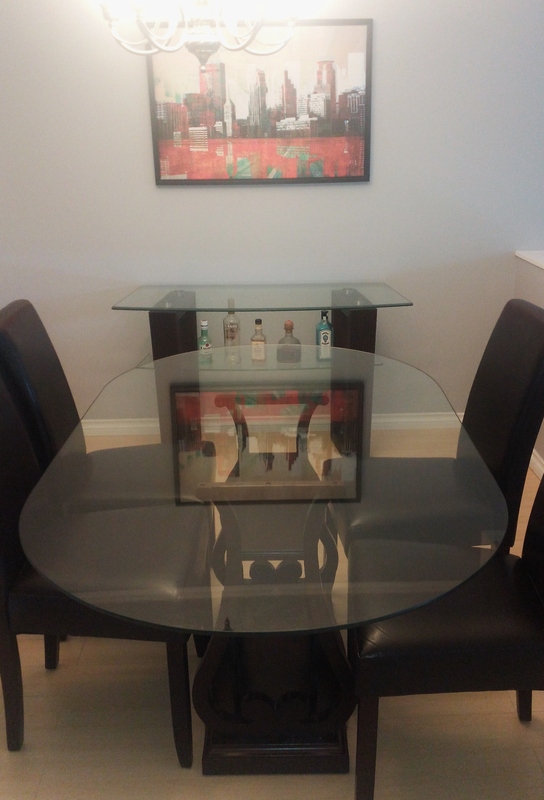 But, the larger size meant we could host more friends comfortably, so function won over preference 😛 With the dining set also came a little glass bar/ side board, and I’m still thinking how to make it more functional with a tray on top- suggestions welcome! 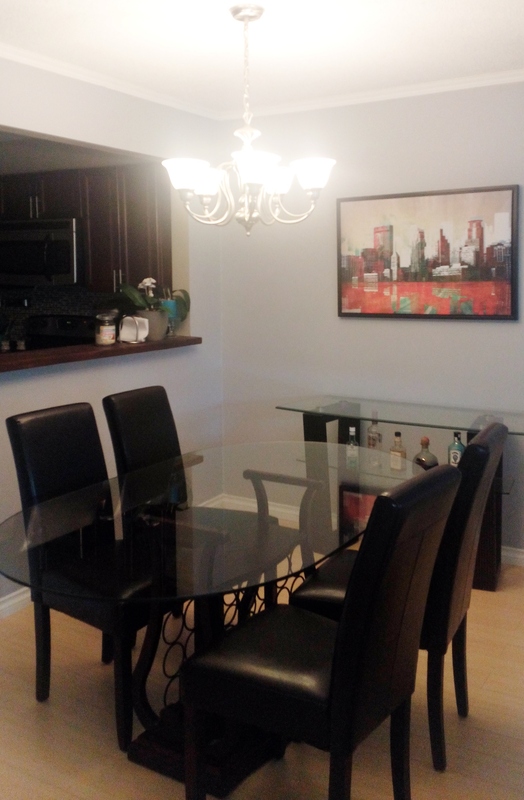 We kept our “Red City” canvas, even though it doesn’t 100% go with the rest of the room, but until we decide on something else, its a nice focal point! We also recently painted the walls a cool gray, to help make the space feel more modern. It looks a bit blueish under certain light, so I might have to play around with the light bulbs in the hanging fixture! One of the major project we undertook for this room was having a focal wall covered in wallpaper! 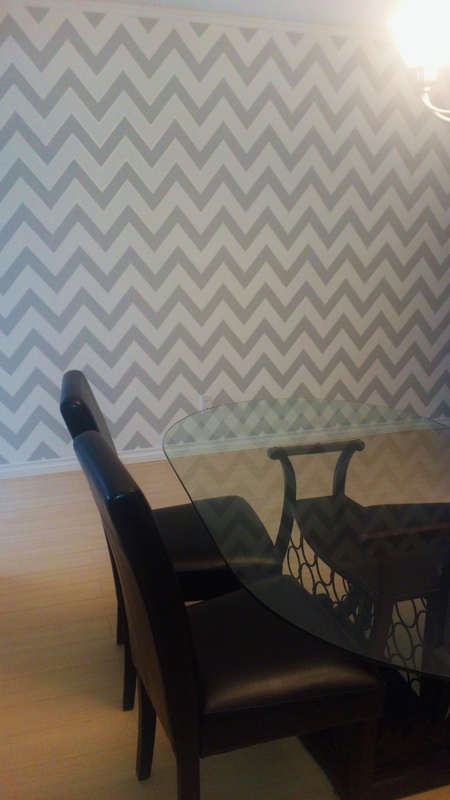 Selecting the wallpaper was the easy part, we both loved the chevron print and the subtle shiny stripe. 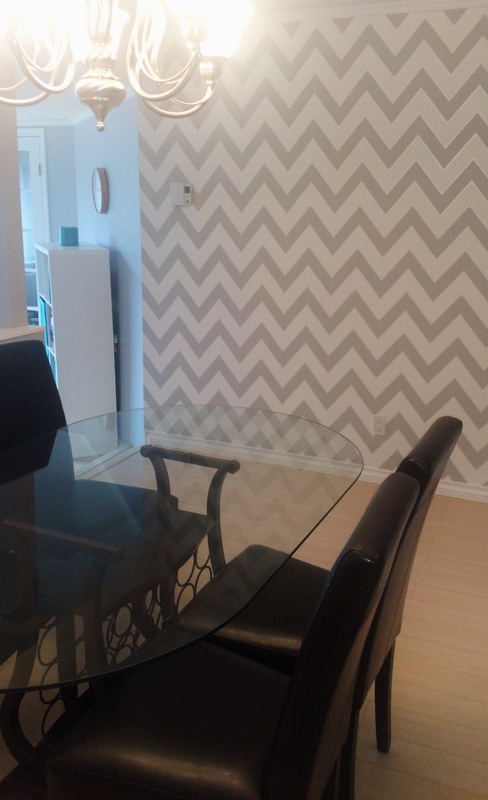 I have never applied wallpaper before, so it was a learning process, but after watching a bunch of YouTube how-to videos, I felt confident enough to tackle it! I think it came out great! So glad this room is done! Still a few decorative pieces I would like to add over time, but I generally go for a more clean and modern look, so I much prefer it uncluttered!